Getting positive reviews for something you’ve written makes a difference in your writing life. You feel like you’re doing something worthwhile, something that resonates with others and provides quality entertainment. That’s my intention when I publish my novels. Several positive reviews I received for my debut novel A Murder Among Friends made me feel like all the sweat-equity poured into the book was well worth the effort. Those readers who read my debut novel and took the time to rate it on Amazon really made by day, my month, my year! Even one reviewer who offered lots of criticism said she would still recommend the book. I am grateful to these readers for reading and enjoying my book, and for being willing to tell the world about it. I suppose it was inevitable that I’d receive a negative review at some point. It was posted by a reviewer on the website Goodreads. I freely admit that at the time, I didn’t know about Goodreads. One of my writer friends exclaimed, “You have to have your book on Goodreads because that’s where all the readers congregate!” He said that because there were thousands of potential readers on that site, I could get free reviews for my book. That sounded great to me! With his help, I dutifully created an author page and put A Murder Among Friends on Goodreads. A woman who said she received a free copy of my book in exchange for a review posted her negative assessment. Now, I’m not trying to be unkind, but I laughed when I read what the woman wrote. I’m still puzzled why she would begin her review by stating she didn’t know what the book was about and was surprised it contained homosexual characters. Had she read the back-of-the-book blurb—which I assumed anyone reviewing a book would do and is precisely why I included it—she would’ve known A Murder Among Friends is a novel about the search for the killer of a pregnant surrogate for a married gay couple, and that the male radio-reporter protagonist is married to a successful male lawyer. Equally puzzling was her statements that she had no objection to homosexuality, but she was unprepared for the sexual content in the book. What? In fairness to that reviewer, she did point out there were no typos or grammar mistakes within the book. However, she ended her review by stating she couldn’t recommend the book. She rated the book two stars. Fortunately for me, I’m not super-sensitive. I didn’t take her dislike for the book personally. At least she provided a back-handed compliment when she mentioned my book didn’t contain any typos or grammar mistakes. That’s a definite boost to any writer’s self-esteem. For one fleeting second, however, knowing someone read my book and didn’t like it caused me to question whether I should’ve omitted some scenes or added others. To be completely honest though, that thought passed by quickly. 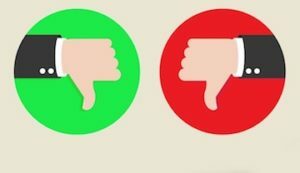 Shortly after I had received that negative review, I read an excellent article by Richard Levesque, a prolific writer, titled Getting Some Perspective on Bad (and Good) Reviews. Levesque pointed out that a negative review is motivated by some specific thing that let the reader down. He asks if a negative review is the writer’s fault that the reader didn’t enjoy the book? He answers his own question by pointing out that a negative review simply displays a poor match between reader and book. I tend to agree with Levesque. I think the negative review on my debut novel was a poor match between reader and book. Not everyone likes gritty or graphic material or subject matter, but that is precisely what I write. Levesque also pointed out that while a writer should not be misled by gushing praise in reviews, she should likewise not take a negative review as a personal affront. I also agree with this statement. Luckily, another reviewer who read my debut novel posted a review that offered constructive criticism coupled with a recommendation to read the book. I hope every writer who gets a bad or good review reads Levesque’s article. It helps keep all reviews in perspective.